Jesse Eisenberg makes a great Woody Allen surrogate. Previously he performed the function in smaller doses in Allen’s forgettable 2012 ensemble comedy TO ROME WITH LOVE, but here he gets to carry the movie as Bobby Dorfman, a young Jewish neurotic (of course) from the Bronx. Allen’s 47th film as writer/director is a period piece set in the late ‘30s that follows Bobby as he gets a job working for his uncle, high powered agent Phil Stern (Steve Carrell) in Hollywood, and falls in love with Phil’s secretary Vonnie (Kristen Stewart). Thing is, she’s having an affair with Phil, who’s married to a woman that we never meet (the way they talk about the wife made me think she’d have some actual presence but no dice). Citing that he can’t leave his wife after 25 years of marriage, Phil breaks the relationship off with Vonnie, and Bobby, who doesn’t know that his uncle was his competition, starts pursuing Vonnie romantically. 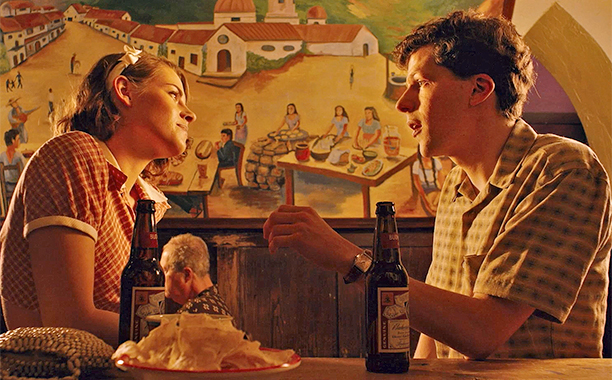 Eisenberg and Stewart, who’s first Allen film this is, have palpable chemistry together in their courting scenes, most likely because they’ve worked together previously as love interests in ADVENTURELAND (2009) and last summer’s AMERICAN ULTRA. Carrell, also an Allen veteran (he had a small part as Will Ferrell’s best friend in MELINDA AND MELINDA), has a juicy role as Uncle Phil, though it’s not as comical as I was expecting. Bobby’s budding romance is cut short when Phil leaves his wife and proposes to Vonnie. Sad that Vonnie chooses Phil over him, Bobby returns to New York and opens a swanky night club called Café Society with his mobster brother Ben (Corey Stoll in a slick hairpiece). Bobby meets and marries a blonde bombshell named Veronica Hayes, played by Allen newcomer Blake Lively, but when Vonnie and Phil visit the club, emotions are again stirred up. The love triangle starts out resembling the one in MANHATTAN, but later recalls CRIMES AND MISDEMEANORS. So yeah, big surprise – Allen again trots out some of his old trusty themes. Shot by Italian cinematographer Vittorio Storaro (LAST TANGO IN PARIS, APOCALYPSE NOW, REDS), CAFÉ SOCIETY looks gorgeous from start to finish. The glamour of golden era Los Angeles is lush, and the grittiness of Ben’s gangster world, in which people get wacked and then dumped into graves of wet cement, is splendid visually as well. It’s Storaro’s first film for Allen, and with hope not his last. It’s an improvement over his last two films, MAGIC IN THE MOONLIGHT and IRRATIONAL MAN, but nowhere near the quality of BLUE JASMINE, which is one of Allen’s best later day films. Despite Bobby’s talk about all the industry talk, name dropping, and backstabbing of the “dog eats dog world” of showbiz, there’s a notable lack of stinging satire. The ritzy world of the beautiful people jet set isn’t so much commented on either. Allen appears to want to indulge in these old timey aesthetics, not skewer them. Also Allen’s voice-over narration is really unnecessary as we can see what’s happening without him needing to tell us. Not sure why he felt it should be added. Parker Posey, who was in Allen’s last film (IRRATIONAL MAN), and Paul Schneider play a married couple of happy socialites who befriend Bobby that I would’ve liked to see more of, as the blonde Posey lights up the screen, and Schneider just needs to be used more in movies in general. With only intermittent flashes of wit, CAFÉ SOCIETY is only lightly comic, but its light charm made it work for me. Setting it in the post-Prohibition era may be just an excuse for Allen to again fill up a film with a jazz standard playlist – mostly Rodgers & Hart songs performed by Vince Girodano & The Nighthawks make up the movie’s wall-to-wall soundtrack – but it’s an era he obviously yearns for and one that can be fun to see him so lovingly recreate. Sure, he did it better in THE PURPLE ROSE OF CAIRO, RADIO DAYS, and SWEET AND LOWDOWN, but there's still amusement to be had here.